Wise folks have said that "Patience is the greatest of all virtues," and that "Patience is the companion of wisdom." But I'm more of a Margret Thatcher man regarding patience.The former prime minister of Great Britain said that "I am extraordinarily patient, provided I get my own way in the end." I knew when I bought a Yamaha C3, a 50 cc scooter, late last summer, that I'd move up to something bigger once I learned to ride. And when I bought a Vespa GTS 250 in January, I knew that once I got my motorcycle permit in March, I'd be able to keep up with traffic, and venture onto roads with speed limits above 30 mph. And now, the day has come to launch into my retirement adventure. Tomorrow, I begin to explore Maine's 3,478 miles of coast. Tomorrow, I will scoot down to Harpswell, and over to Bailey Island. I waited nearly two months to ride my new Vespa home - one of the greatest feats of patience of my life. Sorely tempted to ride without the required motorcycle permit, I weighed the highly unlikely possibility of being stopped by a cop sans permit against my unlucky history with the authorities. Most certainly, as I rode blissfully past a trooper, a call would go out: "Calling all cars - there is a $500 bonus for ticketing any rider of a scooter who lacks a permit. There is an additional $100 if the rider is over 60 years old, and $100 more if he has a scraggly beard." Oh, yes - I waited until I was legal. And I waited for most of the snow to melt. Here, I am slipping down my driveway on a day when patience was just another word to ignore, as my dear wife updated my life insurance policy. Congratulations on your patience and your new GTS. 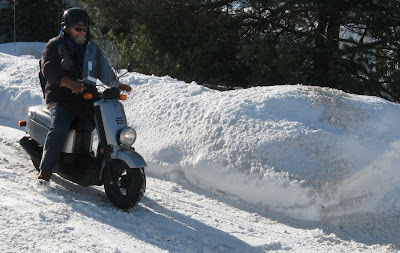 I can attest to the utility of the scooter and the adventures it can embrace. Looking forward to your writing about the Maine Coast. And to pictures of the scooter with a moose or two in the background.